“Chermany” spoke last week and the world listened. Was what it said coherent? No. Was what it said self-righteous? Very much so. Was what it said dangerous? Yes. Will wiser views still prevail? I doubt it. You may have heard of Chimerica – a neologism invented by Niall Ferguson, the Harvard historian, and Moritz Schularick of the Free University of Berlin, to describe a supposed fusion between the Chinese and American economies. You may also have heard of Chindia, invented by Jairam Ramesh, an Indian politician, to describe the composite new Asian giant. 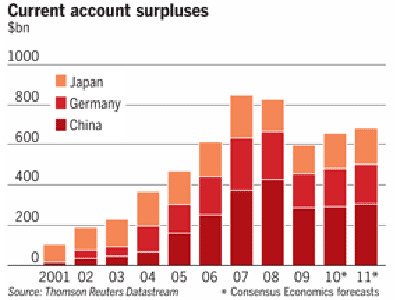 Let me introduce you to Chermany, a composite of the world’s biggest net exporters: China, with a forecast current account surplus of $291bn this year and Germany, with a forecast surplus of $187bn (see chart).